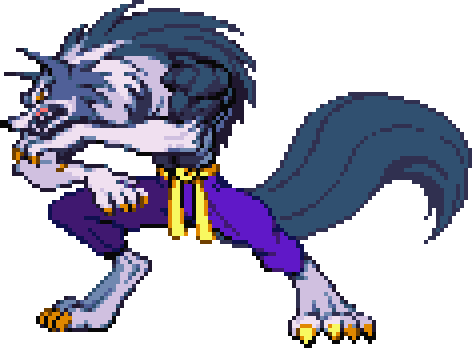 J. Talbain (full name Jon Talbain) is a darkstalker who is cursed to fight as a werewolf. The Kreutz family is one of the seven noble families of Makai. Though its title is a noble, it would be more suitable to call it an army of warriors and fighters. The current master Xell stands at a height of 5 meters and is a war dragon. He has the most unusual appearance out of all the noble classes. And those who are of his family also have appearances that are far from a human form. But there is no vulgarity and roughness within the family. Unlike the savage forms, they are all first class fighters who are highly trained. They are an organized group who follow orders under strict discipline. They are very loyal to their master. Failing to complete an order or betrayal is paid off with death. Though their numbers are few, they possess powerful one hit attacks and are feared as the "bullet of Makai." Baraba Kreutz, titled as the "Wolf Lord", is the leader of the royal guardsmen of the Kreutz family. His eyes were the eyes of those who survived countless life-or-death situations. 20 years ago, he had wandered into the human world. But he had forgotten most his memories of his time in the human world. Though he vaguely remembers about the woman who cared for him when he was injured in the human world. When he came back to Makai, he played an active role as a fighter of the Kreutz family. Demitri had even said, "He is my best rival in my life." Demitri felt a certain kind of beauty in Baraba's fighting. A kind not found in the lower darkstalkers. But roughly ten years after he returned to Makai, he suddenly disappeared. Master Xell had searched for him for many years, but he could not be found. Some say that he had returned to the human world to reunite with the woman again. But no one knows the truth of the events. Jon's mother died shortly after giving birth to him, and there was no way to look for his father (assumedly Baraba Kreutz). When he found out he was a darkstalker, he felt no anger towards his parents. To him, his parents were just conceptual parents. He was alone since he could remember. He maintained his human self by cursing his fate. His heart was not strong enough to accept everything and to move as his heart desires. Following his inner voice, he devoted himself to fighting to take himself past his limits. This was part of his pride as a human to fight against his other half. After the events with Pyron, he had lifted his curse and regained his human form. But this was a temporary illusion that he caused. It was impossible to cleanse his own blood. His will couldn't change the future. During the battles in Majigen, he came face to face with his dark self within. The fate that was pulled by his battles. To flee from his curse, he keeps taking himself past his own limits. Though there may be irreversible consequences, he had no choice but to keep going forward. His fate afterwards is unknown. He now lives as a hermit, hoping to find a meaning to his curse. In Darkstalkers 3, his ending shows that he takes care of two children. When hit by Anakaris' Pharaoh's Curse, he becomes a Dachshund. When attacked by Demitri's Midnight Bliss, he becomes a woman in a plain robe with pointed wolf ears on her head and a wolf's tail sticking out from behind. 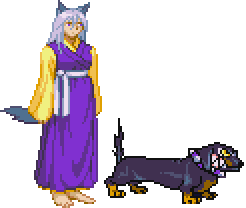 He has never been married, but it is shown in Darkstalkers 3 that he has taken care of some children. His name is a reference to John Talbot, the father of Lon Chaney Jr.'s character (who becomes a werewolf) in the classic movie The Wolf Man. Talbain has never killed a human being. Unlike his father, he is a hermit who likes to be alone, but will always help someone who is in trouble and crosses his path. B.B. Hood seems to bear a grudge against Talbain and wolves in general as indicated in Pocket Fighter, where she is seen in the background harassing him and her ending in Darkstalkers 3. This is possibly a nod to B.B. Hood's conceptual origins. Baby Bonnie Hood's grandmother was killed by a werewolf, but it was not Talbain. This page was last edited on 20 February 2018, at 02:44.